Mary is an eagle monitor along with biologists from the East Bay Regional Parks Stewardship Department. Mary has also monitored other raptors -- such as peregrine falcons and golden eagles -- for the GGRO (Golden Gate Raptor Observatory) for close to 8 years. Through her volunteer work overseeing these birds and their nests, she's been able to capture stunning photos that are shared on her Flickr account. Late September was the last time Mary saw the bald eagle fledgling. 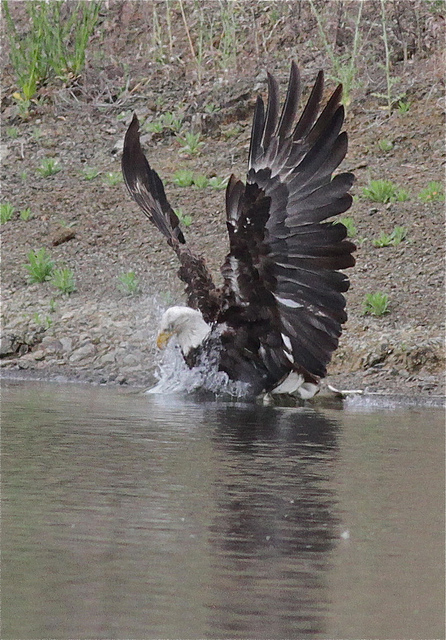 She observed a second-year sub-adult at Lake Chabot in April of this year. It’s hard to know if that was the young from last year’s nest coming back, or if it was some unrelated juvenile passing through the area. It didn’t stay. 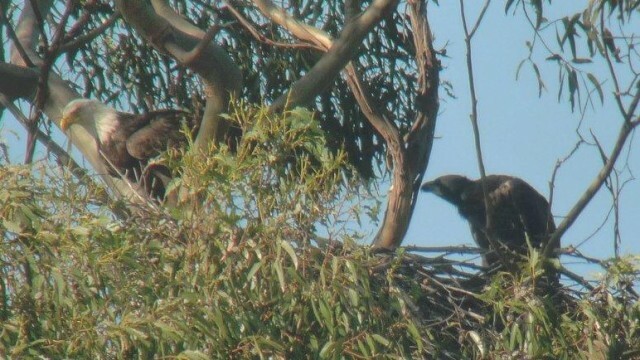 If you want a chance to see the eagles, you can check them out in the next couple of months at Lake Chabot. I was lucky to see the eagle parents both times I hiked at the lake on the West Shore Trail. The best view is from the Alder Point fishing area. You can also get good views from the dam, although now that the juvenile is airborne, they might be anywhere around the lake. The nest is well hidden and I haven’t been able to spot it. An interesting fact: the underside of an eagle nest is surprisingly a pretty safe place to raise a family if you’re a house finch; they have used the underside of the nest to raise their own brood both this year and last. Mary said she’s seen the eagle chick watching the finches come and go.